Mark Self has been named senior pastor of Trinity UB church in Fostoria, Ohio. He graduated in 1994 from Kentucky Mountain Bible College with a degree in Pastoral Ministries. Since 1987, he has served as youth pastor, associate pastor, or pastor at five different churches. Most recently, he served 14 years, 2000-2014, as pastor of Christ’s Community Church in Navarre, Ohio. Mark and his wife, Debbie, have three grown children, ages 18-24. Global Ministries is sponsoring a trip to Jamaica during January to work at the Malvern Camp. 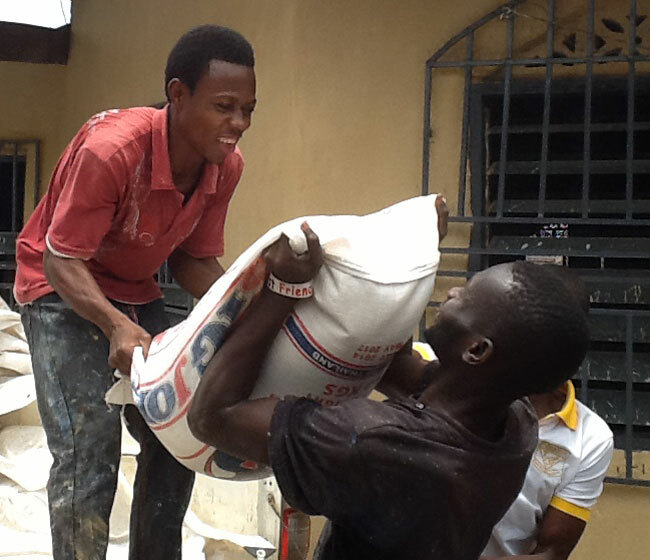 The team will continue work on the new dormitory at the camp. The first floor is completed, but work needs to begin on the second floor. 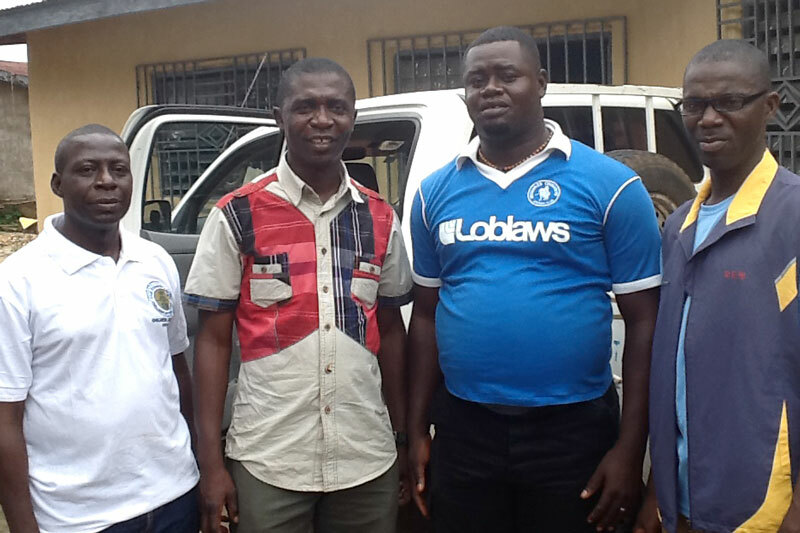 Team Leader: Dwight Kuntz (right). Cost: $750 per person, plus airfare. The $750 includes in-country travel, food, lodging, supplemental health insurance, and cost of materials. L-r: Peter Kainwo, Bishop John Pessima, and two pastors from Kenema. Rice and other food items for UBs in Kenema. 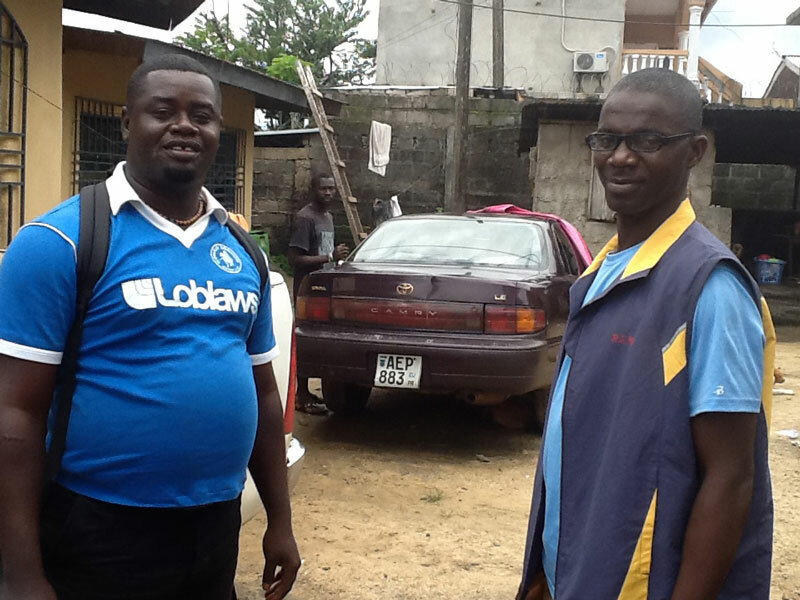 Kenema, the third-largest city in Sierra Leone, is at the center of the Ebola outbreak. The city has been sealed off by government troops. 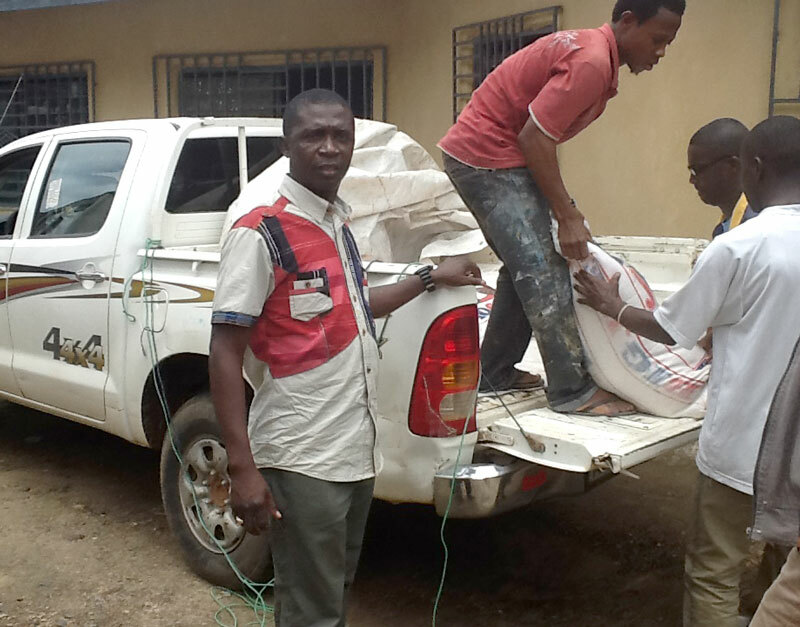 The Kenema hospital is the primary hospital for dealing with Ebola. A number of healthcare workers there have contracted the disease and died. One was a United Brethren pastor’s wife. 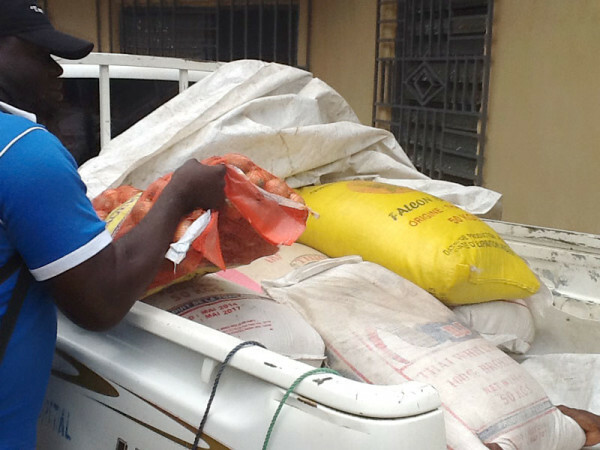 On Saturday, August 23, Bishop John Pessima of Sierra Leone Conference took rice and other food items to Kenema for United Brethren pastors and members in that area. He was accompanied by his four superintendents. Three of them were stopped at a checkpoint. However, Bishop Pessima and Superintendent Peter Kainwa were allowed into Kenema with the items. Bishop Pessima writes, “On behalf of the conference, I want to thank Global Ministries for their support during this crisis, Dr. and Mrs. Jusu in Kenya, Faith UBC Church at Lumley, and many more that are supporting us. It is not yet over. 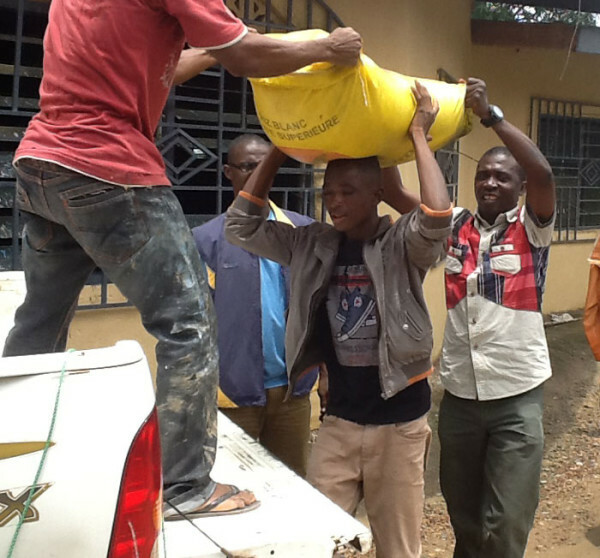 We are still raising more food for Kenema, because it is really had for them at this time. 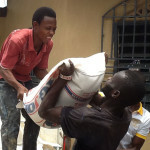 Bishop John Pessima (left) as food supplies are being unloaded. 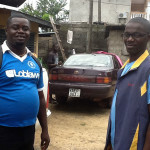 Two United Brethren pastors in Kenema. 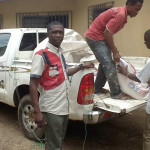 Unloading food supplies for Kenema. Steve Smith, senior pastor of Lake View UB church (Camden, Mich.) is undergoing heart surgery on Tuesday, Aug 26, at the University of Michigan Cardio Vascular Center. He has congestive heart failure. He says he will undergo a new form of cardio ablation which has not yet been approved for practice in the United States, though it has been used with good success in Europe and Canada. The first procedure will occur Tuesday morning, Aug 26, at 9:00. It will check for clotting and blockage around the heart. He will then be prepared for the 1 pm surgery, which will take 5-6 hours. Steve says he is counting on being released Wednesday afternoon, but it may be Thursday. Steve’s wife, Pam, will be with him. You can email them both: pam@lakeviewch.org and steve@lakeviewch.org. For the seventh year in a row, The Princeton Review named Huntington University one of the best colleges in the Midwest. The nationally-known education services company recommends the school as one of 159 institutions in 12 Midwestern states on its “Best in the Midwest” list for 2015. Read more. 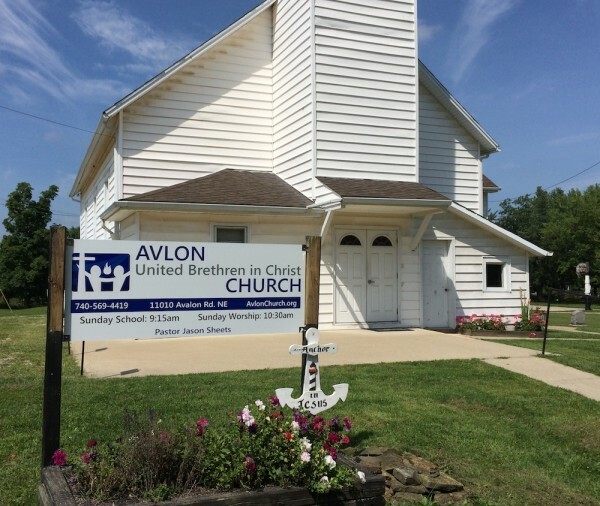 Avlon UB church (Bremen, Ohio installed a new sign in front of the church. It incorporates the new UB logo. 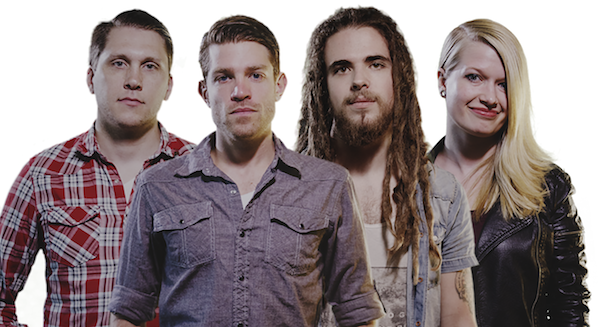 The band Attaboy, which is associated with Huntington University, will lead worship at the upcoming UB Women’s Conference. They will share their latest ministry emphasis to students. The conference will be held September 19-21 in Huron, Ohio. 22 Aug Baptisms in Orrstown, Pa.
Ken Williamson, pastor of Orrstown UB church (Orrstown, Pa.), reported that they baptized five people this summer. Yesterday, our church opened the altar following the services to pray for our brothers and sisters in Iraq and around the world who are being persecuted. The altar was filled with 48 adults. May I challenge all of you to do the same and make it a day of prayer for our world wide church family. Marylou Birdsall passed away at 3:30 on Thursday, August 14, 2014. She was 85 years old, and living at Swiss Village in Berne, Ind. Visitation: 9-11 am Tuesday, August 19, 2014. Funeral: 11 am Tuesday, August 19, 2014. Sons Doug, Brent, and Brian will officiate. Location: Swiss Village Chapel, 1350 W. Main St., Berne, Ind. Memorials are to be given to Huntington University. You can sign the on-line guestbook at the Yager-Kirchhofer Funeral Home. Burial will be at the Pilgrims Rest Cemetery in Huntington, Ind., with graveside services at 1:30 pm Tuesday, August 14. Marylou and her late husband, Roger, served in the pastorate for 39 years, pastoring five United Brethren churches and one non-UB church. She was a true partner in ministry with her husband. She is survived by sons Doug, Brent, and Brian, and daughter Connie Potter. In addition there are 15 grandchildren and 12 great-grandchildren. Marylou attended Huntington University, where she met and married seminary student S. Roger Birdsall. They both graduated in 1950 and moved to Boise, Idaho, where he began his pastoral ministry and she began her elementary teaching career. Their first two children, Connie and Doug, were born there. In 1954, the Birdsall family moved to Sylmar, Calif., to serve another United Brethren church. Two more sons, Brent and Brian, joined the family there. In 1960, the family moved to Peoria, Ill., where they spent the next 22 years pastoring First UB church of Peoria. Marylou taught hundreds of students at Rolling Acres Elementary School until her retirement in 1983. Rev. and Mrs. Birdsall frequently traveled internationally upon retirement, including extended mission trips to visit their sons who were missionaries in Sierra Leone, West Africa; Tokyo, Japan; and Kiev, Ukraine. They also traveled together to teach at Bible colleges in Jamaica and Bangalore, India. Marylou was known and loved at church and school for her musical talents at the piano and organ. She continued playing the piano almost to the end of her life for Rotary Clubs in Huntington and Berne, for handicapped persons, and at Swiss Village for the enjoyment of residents and staff. In addition, many people appreciated her easy laughter, pleasant disposition, and imaginative story-telling. Being a mother and grandmother as well as mentoring other young women “who just needed a mother” brought her great joy.